While typing a fuzzy definition, the program provides suggestions for relevant types taking the number of occurences in the database into account. In the table description format columns are separated by "|". The columns can either be exactly or fuzzily specified whereby fuzzy definitions are not supported for translation into queries. Additionally, for any column filters and an order can be set. A column can also be explicitly linked to another column, when the query translator's column linking is not as intended. This data was extracted from a Freebase dump. The pair (<location.citytown>, <location.country>) can be matched with this template. Removing the "DISTINCT" in the query will result in the counts for each candidate relation. The one with the highest count in this case is <location.location.containedby>. The pair (<film.film>, <film.actor>) can be matched with this template. The types are connected via the mediator <film.performance>. The best matching candidate relations are (<film.film.starring>, <film.performance.actor>). This template matches a type with a direct relation like (<olympics.olympic_games>, <time.event.start_date>). Only the total resultsize can be considered here, because no candidate relation has to be find. This template matches a type with an indirect relation like (<location.citytown>, <location.geocode.latitude>) via the mediator <location.geocode> and matches the relation <location.location.geolocation> best. This template matches a type with a direct mediator relation like (<location.citytown>, <location.statistical_region.population>). The mediator is <measurement_unit.dated_integer>. The program simplifies the creation of desired queries for Freebase by helping to explore types and relations and automatically finding linking relations between columns. Furthermore, the user does not need to know if a type has a name or not (each named type requires an additional triple in the query like ?citytown fb:type.object.name ?citytown_name) and whether a mediator has to be used for linking or not. Query delivers the intended results. Basic idea is to find Wikipedia tables whose content also exists in Freebase (or Wikidata). 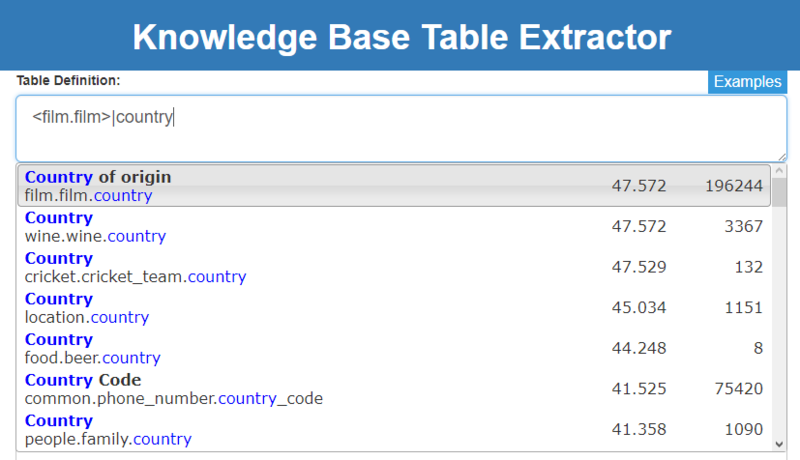 At the moment, the program only allows exact table descriptions for query translation. Fuzzy columns would cause a much bigger set of exact definition pairs to be matched. A smarter ranking approach is needed here. In some cases, the user may not want the matched relation with the most occurences. Dropdown lists for readjusting each column pair would help the user to find the desired relations. Since Freebase was shut down in 2016 and its data will be moved to Wikidata. Adapting the project to a Wikidata backend would maintain usability in the future.